It's been raining here almost non stop since Thursday - makes you want to curl up under a blanket and do nothing but watch movies....I'm hoping to have some more artwork to share with you later on today provided I can get good pictures, this dreary weather is playing havoc with my photography! 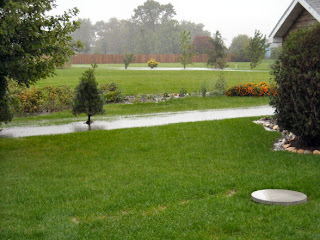 As you can see - we now have our own little waterway on the side of the house. Hey Lisa sorry about all your rain if you are sick of it I will send you some sunshine if you will send me some rain..lol. Hang in there stay warm and dry and hope you get to stamp and click soon. Sorry to hear about the rain Lisa!! I have similar pictures from a rainstorm we had here one time. Hopefully you won't get any damage to your house. Good luck with the pictures too!! Waterway Lisa? 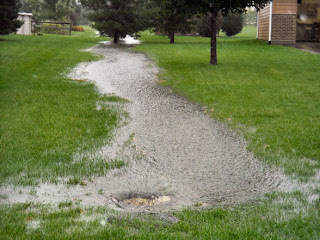 Look like at least a creek to me... Hope the rain doesn't depress your mood! Looking forward to more of your creations. Hope you stay safe and dry. Oh it looks so beautiful and green! Where in the country are you? We need rain where I am in California.